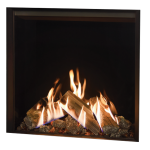 Gazco's most realistic flames yet, our newest gas fire that is reminiscent of a traditional wood burning fire with its innovative burner system and hand painted ceramic logs. 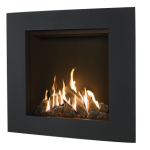 Gazco’s new Reflex 75T gas fire has ultra-realistic flames thanks to its innovative burner system, featuring burners that are hidden inbetween the ceramic logs. This way, the flames not only create a varied effect by being at different heights, but they also envelop the logs to create a distinctly realistic wood burning fire effect. 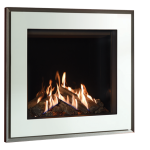 The Reflex 75T enjoys the benefits of three sets of twin burners which can be controlled independently of one another, to create any ambiance the homeowner desires. In addition, the LED Emberglow up-lighting systems create authentic embers which can be enjoyed both with and without the heat. The Reflex also enjoys the benefit of having a non-reflective glass front. This gives homeowners an uninhibited view of the flames as well as enhancing the beautiful open-fire aesthetic. This gas fire has also been specifically designed to fit into a standard 36” chimney breast, offering a versatile installation, as it can be styled for in a more traditional setting as well as being fitted into a more contemporary house for a modern finish. 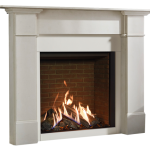 There are a range of frames and stone mantels all of which can be paired with the Reflex 75T for a distinctive look. 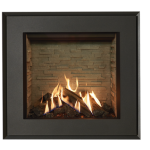 Lining options compliment the fire for a variety of styles, and can be matched to the overall look and feel of the room. Check with your local retailer to get more information about our newest and most realistic gas fires.